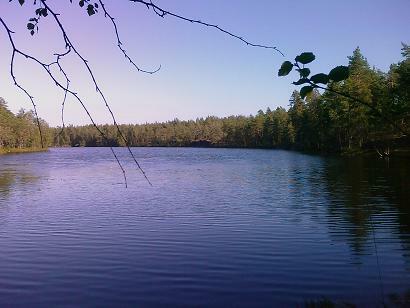 Iso Majaslampi is a silent and peaceful lake in the heart of Nuuksio wilderness. 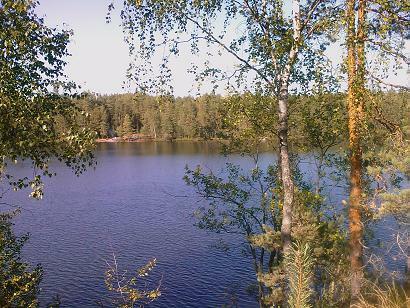 It's 93 meters above sea level, which makes it second highest located lake in Nuuksio. [KANSALLISPUISTO] Kätkö sijaitsee Nuuksion kansallispuistossa, joten Metsähallituksen ohjeiden mukaisesti siitä on ilmoitettu Etelä-Suomen luontopalveluihin. Lisätietoja kansallispuiston luonnosta, reiteistä, palveluista,ohjeista, säännöistä jne. tarjoaa mainio luontoon.fi-palvelu. Huomioithan luonnonsuojelualueen säädökset siellä liikkuessasi. Nuuksio wilderness is close to Helsinki metropolitan area and can easily be reached by public transportation. Terrain is hilly and scattered with many lakes, so don't try to walk along bee-line. Iso Majaslampi is off from main routes thus no major paths are available. Getting there is small challenge, but nothing too bad. Take your time and enjoy the walk. There's plenty to see along the way. Cache-box is easy to find and quite easy to reach, although biggest guys may need to hold their breath. Box is smallish regular and it contains only logbook, cache-note and pencil. Please re-hide it well. 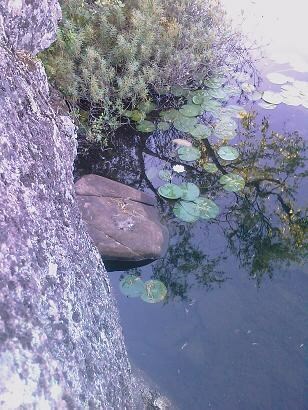 Iso Majaslampi gets its water from rain and from surrounding swamps. There are no major waterways or bigger ditches leading to lake. 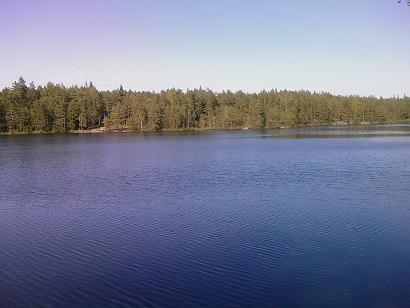 After heavy rains overflow channels go through western swamplands towards lake Pöksynhaara. [LOGGING] Since there are many new geocachers around, it's probably good to give some logging instructions. You have spent hours for geocaching, how about using minutes for logging? Carry a notebook with you on trail, thus you can make your notes right after finding the cache, when things are fresh in your memory. In on-line logging you share your experience and it's also a kind of diary for yourself. You don't need to be Kurt Vonnegut or Kalle Päätalo to write good personal logs. It takes much less time and effort than the caching trip from where you just returned. If you really don't want to write proper logs online, then it's better that you don't log on this page at all. Groundspeak sets the following guideline to cache owner: The responsibility of your listing includes quality control of posts to the cache page. Delete any logs that appear to be bogus, counterfeit, off topic, or not within the stated requirements.